The model below can be found in H. P. Blavatsky's Esoteric Instructions (See INSTRUCTION No. I, 1890 , Blavatsky's Collected Writings, Vol. 12, p. 524). The model below can fittingly be compared with any other models about life and creation, as well as spiritual development. The most important is that the model used by the individual Seeker after Truth also truly and in reality works for the individual. The two diagrams as a whole are explained very well by H. P. Blavatsky's in her work "The Secret Doctrine" vol. I + II, and also in other of her writings. These diagrams can easily be used as a framework for the study of the wisdom teachings. The two diagrams should be connected by the unmanifested Logos used in both of them. Important. H. P. Blavatksky's teachings are different than many other earlier and later esoterical papers on the same by seeking to create a synthesis of the kernel of wisdom in the most central of the numberless religious doctrines of the ages. This is something the theosophical seekers in various countries and cultures could consider and evaluate. 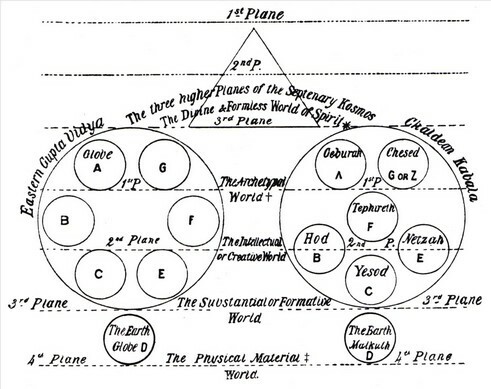 An explanation of the diagram is given in H. P. Blavatsky's book The Secret Doctrine, 1888, vol. 1, p.157, 1st edition. An explanation of the diagram is given in H. P. Blavatsky's book The Secret Doctrine, 1888, vol. 1, p.200 and other pages, 1st edition. I will happily add to the below, that there are some interesting and valuable additional information in The Jewish Encyclopedia from 1905 about the fact that two extra sepiroth was added to the Kabala in the elleventh century by a jewish scholar. The original Eastern version only had eight sepiroth. These eight sepiroth can perhaps with advantage be compared with the great carpet which once covered the entrance to the Lahsa temple in Tibet and also the symbol used at the Shigatse monastery. It is also today called: THE GLORIOUS INTERWOVEN KNOT OF LIFE (SHRIVATSA Palgyi Behu Balbu) the Mystic Diagram representing the Great Love of all the Buddhas, and the never-ending continuity of the Teachings of Buddha's Mind; the knot of Love; the thread which guides to happiness. - So there we have the cosmological teachings already at the entrances of these temples. Even so theosophy is not orthodox Buddhism. And we find that H. P. Blavatsky mentions the Kabala a lot when dealing with cosmological teachings in her book The Secret Doctrine. (See for instance The secret Doctrine, vol. 1, p. 177-247 or the whole book as such.) 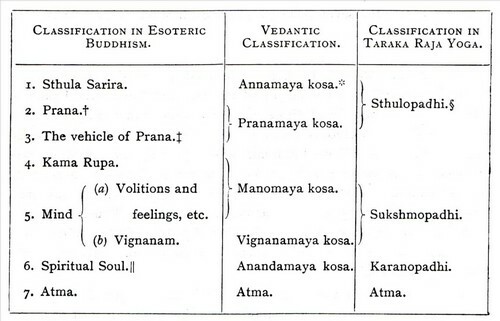 Blavatsky's "Eastern Gupta-Vidya" is therefore as I see it a more precise version of the Kabala.